Hi again folks, looks like it may be clear tonight so going to have another few hours getting to know the night sky. My question is when i do eventually find Andromeda what should i expect in the EP and should i just use the wide field view that came with my SW150p? I am aware not to expect much but was wondering how much of the EP it would fill ie 1mm or 4mm etc. I am only in the back garden tonight with moderate light pollution will this effect my finding of it? The 10mm and the 2X Barlow in various combinations just produced a more spread out grey blob with no more detail. I'm hoping that I'll see a bit more when the sky is a bit darker, but I think with a 6" primary mirror we're stuck with grey blobs mostly when it comes to visual DSO observing. Incidentally M31 was spread out over an area larger than the fov when combining the stock 10mm with the Barlow. Finally I think you should find it even with moderate light pollution - my first view was in the presence of a nearly full moon and was still easy enough to find, and it will be quite high up in the sky so the atmospheric effects are much less than at other times of the year. Andromeda will be a fuzzy blob. It will be best in a wide field eyepiece as low mag will get a brighter image. Its a very large object so low power is the way to go. Personally I like the views of it through 15x70 binoculars more than with a scope. It won't look like the photos of course - expect a fuzzy oval with a much fainter "halo" around it under really dark skies. The fuzzy spot of M32 and the much fainter patch of M110 (galaxies) are very close to it and can be seen in the same field of view with a low power, wide field eyepiece. Thanks people thats great, quick responses as always. Well I saw it for my 1st time on sat night via a pretty basic 130 reflector, in good seeing cnds Id say, so I assume yours will be a bit better, but for an idea: with a 32mm plossl + 2xbarlow I saw it quite clearly and about 3cm wide (that being call it 'about 20cms away from my eye' as it were) so maybe expect about 3/4" wide? Thats probably completely useless spiel but it makes sense to me as a newbie so it might you too! a fun galactic goose chase finding it, as much as it was viewing it. Its a mere small smudge-with-glowy-middle for me, but a mighty interesting one. If the 150P is the 1200mm focal length one and if you are using the 25mm eyepiece then you will see about 1 degree through it. As Andromeda is 3 degrees across all you will get in view is the central bulge maybe not even all of that. If the scope is f/5 then 650mm focal length you will get a 2 degree view through the eyepiece so you will get 2/3 of Andromeda in, again not all of it. Size in astronomy is in angles not mm. My best view with my 200 dob was through a 38 mm 70* eyepiece giving 31x, all of andromeda was well within the eyepiece as was M32 and M110. I saw M31 recently at Kelling using a 35mm Panoptic in a 20" dobsonian on the pitch next door. It was amazing - the detail on view just knocked my socks off - never seen it like that before - filled the eyepiece with about 2/3rds of the galaxy. I still enjoy locating and viewing it in 10x50 binocs though - even if it is just a fuzzy patch in the sky. But I'll never forget that awesome view - thanks to Clive and Ron. It's a fabulous object whatever gear you are using. Ive only ever used a 25mm or 32mm EP to observe it. Cant say i have ever noticed M110 though. Maybe the scope i was using didnt have enough aperture to detect M110. 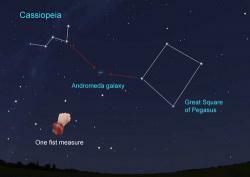 I have yet to observe M31 with my 8" scope. I had the pleasure the other day to view M31 armed with a 4 inch scope and a 25mm EP, its a tough and frustrating time when your are limited via your scope but onwards and upwards. It's about as bright as M1, the Crab Nebula Paul. A lot fainter and more diffuse than M31 and M32 so easy to miss if there is any light pollution / moonlight around. Your 8" should pick it up easily enough under a darkish sky though. Amazing how many and trying to get a glimpse and also how rewarding to hear the stories, especially Brantuk's. I've tried two attempts with new SW f/5 130mm but still not sure what I've been seeing. Have tried starhopping from Mirach to HIP3840, and then best guess to M31. On both occasions I've viewed a small smudge at 26x and 65x. I think my next step is the 7x binoculars when it clears up again to confirm what's going on up there! I've read the width is many more degrees than a full moon and maybe I cannot see the woods for the trees?! Still not convinced I'm not looked at M110 but would my 130mm pick up visual magnitude 10.0 in a slightly light polluted sky? I have no filters on board either. To be honest, once i set my mind to observing M31 (I can just make it out with the naked eye from my back garden), i tend to concentrate on that and perhaps overlook M110. I think this is the reason why i cant remember ever seeing it. I am sure my 8SE will pick it up. I have not even seen M31 with my 8". I must remember to have a look for M110 in the future, while i am observing M31. M31 is very doable in a 4" scope and a 25mm EP. I found that once you locate M31 via any optical aide (even just your eyes), you tend never to lose track of it and at a glance you can look at the sky and detect it. My method is to go to Cassi and drop down from the second star on the right: Trust me when you see it, you will know it. Many people use the square of Peg to find it, i work in reverse and use Cassi to find it.